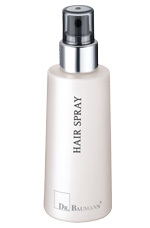 Protecting hairspray for hair and scalp. For a light hold, spray the hair from a distance of between 30–40 cm. Hold the hairspray nearer to the hair for a firmer hold. To restyle the hair quickly, spray each strand separately and dry using a round brush. The HAIR SPRAY is easy to brush out and leaves no residues in the hair after washing with SHAMPOO.